Immense understatement aside, basically Goethe is to German literature what Shakespeare is to English literature, and nobody with more than a passing interest in reading German can really avoid picking up one of his works before long. Last year, I read Die Leiden des jungen Werthers, a rollicking, emotion-charged epistolary novel, and this year I have added to that with a bit more prose (I’m leaving Faust, his most famous work, until I’m a bit more confident in my German – like never…), so here are a few brief, confused thoughts on some of his works. 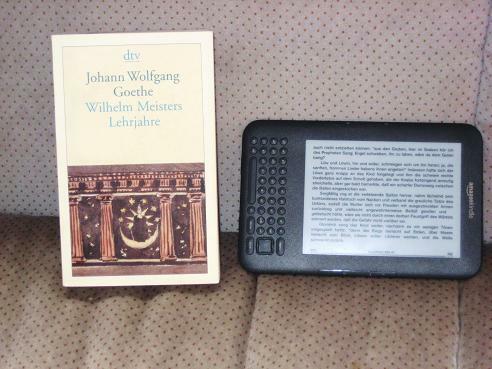 Earlier this year, I spent a good two weeks tussling with a monster of a book, Wilhelm Meisters Lehrjahre (Wilhelm Meisters Apprenticeship), the first Bildungsroman and an absolute classic of German literature. Wilhelm Meister, the son of a middle-class trader, is earmarked to step into his father’s shoes; however, he has a passion for the theatre – and women -, and this leads him to decide to break out on his own and follow his passion(s). A naive, young man, Wilhelm makes a multitude of mistakes during his travels, but the sum of his experiences will make him into the successful man he is to later become. In this (rather thick) book, Goethe is asking us to be patient towards the young, putting forward an idea of youth as a time for experimentation, a chance to follow your dreams (which was not as self-evident then as it can be now). It’s all very interesting, but it did drag a little, and there are times when you wish that Wilhelm would hurry up and reach maturity a little faster… In short, it’s not one for the casual reader, unless that casual reader is pursuing a PhD in comparative literature (which you may well be – I know my readers are extremely erudite). Werther, while rather melodramatic and over-the-top at times, would be a much better introduction to the great man’s work for most of us. Not all of Goethe’s prose is lengthy though, and our next example is fairly brief. Novelle is a, well, novella, written according to what Goethe decided novellas should be (and when Goethe decided something, there were usually people with chisels and stone tablets on hand). In this short piece of fiction, a single event is described, a noblewoman’s ride out into the countryside of her domain and the effects of a fire which breaks out in a nearby town. When things go wrong, the writer shows us two ways of dealing with the same problem, allegories for dealing with issues in real life. Luckily, my final choice for today was far more satisfying than Novelle – when I actually managed to find the whole text. Unterhaltungen deutscher Ausgewanderten, which could possibly be translated as Entertainments of German Emigrés, is an intriguing work, consisting of seven stories of varying length contained and augmented by a frame narrative, the start of which takes up a good chunk of the book. A family of nobles is displaced by the advances of the invading French troops, and, after a political quarrel upsets the peace in their temporary home, they all decide to ignore the events of the outside world and get along in harmony by telling each other interesting stories (the Unterhaltungen of the title). Wilhelm Meisters Lehrjahre – Interesting, but long, and not one for the novice. Novelle – A bit over my head and not my favourite bit of G-Lit (to put it mildly). Unterhaltungen deutscher Ausgewanderten – Very entertaining, and difficult to source electronically (even in German!). Great post, very informative. I never read any of Goethe's boosk I twitted it to my bookish following. Werther. Oy Vey! Just do it, dude and put us all out of our misery. German amazes me with its loooong words. I get Mr BV to translate sometimes and we fall about laughing. I've never felt compelled to read German Lit in translation. It's probably better in the original. Great post, I've only read the G-man in English, a good few years ago, when I was doing my grand tour of Europe VIA literature. So where next, how about a travelogue through the works of Hesse. If you can read Wilhelm Meister in German, you are more than ready for Faust. Man of la Book – Thanks 🙂 It's time for me to get stuck into the real meaty classics (it's a public service really!). Translating from German into English can be a little tricky; sometimes the concepts don't quite come across smoothly, even when it makes perfect sense in the original. Also, just as you need to have read a lot of V-Lit to get into 19th-C England, it helps to have read around the author and period for everything to fall into place (says the totally unqualified charlatan…). Always worth giving it a go Stu (and having Goethe on the bookshelves is always good for the old street cred!). Oh, he's not that bad really 🙂 In fact, some of the stuff I've read is very clear and easy to read (although 'Die Leiden des jungen Werther' was a bit archaic at times!). Do you think anyone would be up for a 2013 Goethe Reading Challenge?